On May 27, 1945, Corporal Kōzō Watanabe took off from Chiran Air Base and died in a special (suicide) attack west of Okinawa at the age of 18. He was a member of the 431st Shinbu Special Attack Squadron. 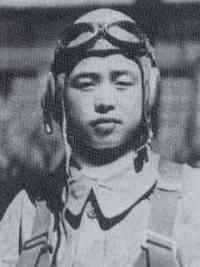 He piloted an Army Type 97 Fighter (Allied code name of Nate). After his death in a special attack, he received a promotion to Second Lieutenant. He was from Tochigi Prefecture and was a member of the 14th Class of the Army Youth Pilot (Rikugun Shōhi) training program. Father, please forgive me for not contacting you in a very long time. I can guess from afar that you may be worried. I apologize for my lack of filial piety. Father, I think that you too are readily prepared, but I also now have received an Imperial command for a special attack. Please be glad. Now I am waiting in the grass at OO  Base for a sortie either today or tomorrow. When this letter arrives, I already will have fallen asleep forever. However, Father, please never feel lonely. I am going before you, my Parents. As the long-cherished desire of a young man of Yamato , I gladly will make a taiatari (body-crashing) attack for a great cause. I will inform you of the news of an instant sinking. I now have no regrets. Please forgive me for my lack of filial piety until now. The letter and biographical information on this page come from Chiran Tokkō Irei Kenshō Kai (2005, 139, 164). 1. During the war due to counterintelligence, information such as a place name or number was written with OO in civilian letters and communication. 2. Yamato is a poetic name for the country of Japan.